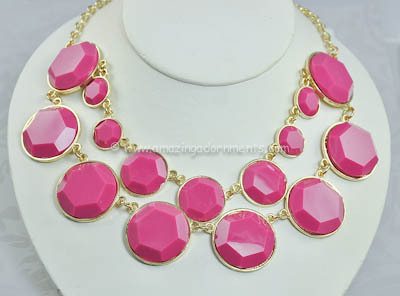 It is easy to see why these necklaces are popular! Wearing one with any outfit completely changes the look. This piece is a two strand bib set with faceted berry colored resin stones. The metal is gold-tone. Unsigned. Measurements: 20" long and adjustable by another 3".